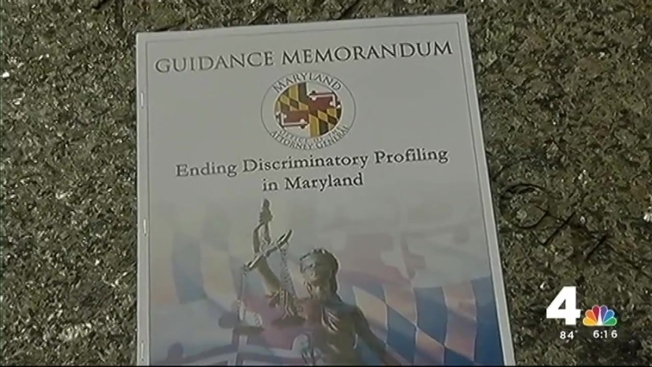 Maryland Attorney General Brian Frosh issued statewide guidelines Tuesday to prevent discriminatory profiling by law enforcement officers based on race, gender and other characteristics. Frosh said in Annapolis that the guidelines are similar to guidance issued in December by the U.S. Justice Department, which called on states to adopt their own. Frosh said Maryland is the first state to issue its own guidance. "We want this memorandum to create the standard for how law enforcement operates in Maryland," Frosh said. Frosh, a Democrat, said the guidance goes significantly further than current Maryland law. First, it defines discriminatory profiling not only based on race and ethnicity, but also on national origin, gender, gender identity, sexual orientation, disability and religion. It also applies to a broader range of police actions beyond traffic stops, including routine police operations and ongoing investigations. The announcement comes as state lawmakers and police reform activists are considering changes in the law to increase police accountability in the aftermath of rioting in April after the death of Freddie Gray from injuries sustained in Baltimore police custody. While Frosh noted that police have difficult jobs and put themselves in harm's way to protect the public, he said there is too much mistrust about how they go about their work, and steps must be taken to rebuild trust between police and citizens. "It is sadly clear that those relationships have become badly frayed -- particularly in black communities, but in many, many places," Frosh said. Use of the guidelines by police would make a big impact on people's lives, Montgomery County Executive Ike Leggett said. He said he was racially profiled the night before his election to a third term. He was putting a lawn sign near a polling place when he was approached by an officer. "As I got out of the car to place my sign, he began to yell at me, using profanity in a very, very aggressive way, in my face," Leggett said. "I was simply shocked by that incident." Prince George's County State's Attorney Angela Alsobrooks said she was profiled as a 14-year-old waiting for her parents after a high school dance, being shooed off a lawn with a bright light and megaphone. "You just never forget that experience. You never do," she said. "This says to me that as an American, you don't have the same rights as others, when you are mistreated and disrespected." Local police departments would need to adopt the guidelines for them to be enforceable. Once departments adopt the guidance, violations could be enforced by those agencies. The Prince George's County Police Chief said he knows the department has not always had the best reputation -- but he said that's changed. "Building a relationship is the key, and that's what we've done, and that's what's changed things," Chief Mark Magaw said. "In the last five years, we've dropped crime to historic levels." Montgomery County Assistant Police Chief Darryl McSwain said the county has already taken measures to prevent discriminatory actions by officers. "We're very comfortable that we're not only meeting those guidelines but in some instances we believe we're exceeding them," he said. "We always have room for improvement and that is what we're committed to in Montgomery County." Vince Canales, president of the Maryland Fraternal Order of Police, said the organization representing about 21,000 law enforcement officers in the state has not taken a position on the guidelines. Canales said he met with Frosh recently, and the attorney general assured him the guidelines were not intended as a slight to police. "It just pretty much put it on paper that this was the way that the process should play out," Canales said. Doug Mayer, spokesman for Republican Gov. Larry Hogan, said the administration will thoroughly review the guidelines. "Currently, all state law enforcement, including the Maryland State Police, receive training and operate under procedures and policies designed to prevent biased policing of all kinds," Mayer said. The attorney general's office will convene training sessions in coming months. It also will ask local agencies to incorporate the statewide guidelines. Interim Baltimore Police Commissioner Kevin Davis described the guidelines as an important first step. "I'm committed to making sure that the standards being released today are part of our practices -- for the benefit of our officers and our community," Davis said in a statement. Later this year, police across the state will undergo training exercises that stress safety, equality and respect. Gerald Stansbury, president of the Maryland State Conference of the NAACP, said he was pleased the attorney general modeled Maryland's guidelines after the Justice Department guidance. "African-American communities have been victims of profiling for far too long, and this is another step that we can build on to ending the practice in Maryland because we know that good policing can be done without improper and discriminatory police tactics," Stansbury said.